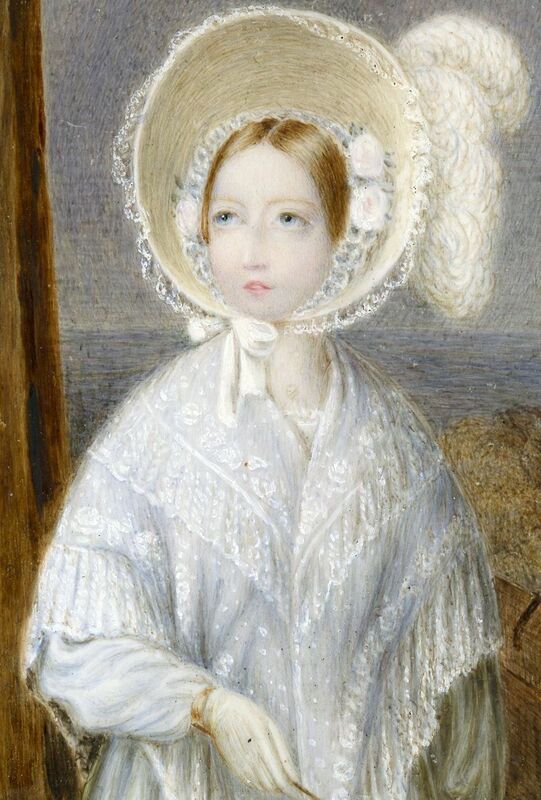 In 1838, whilst still within the early months of her reign, William Corden Snr was commissioned to paint a watercolour portrait of Queen Victoria standing on the East Terrace of Windsor Castle overlooking the River Thames. 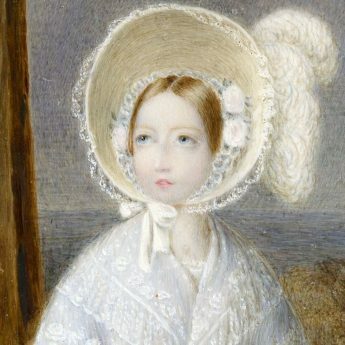 It is this portrait that the artist’s son, William Corden Jnr, used as inspiration for this miniature of the demure young Queen seen here wearing a green dress under a delicate lace shawl with a striking straw bonnet trimmed with ostrich feathers and worn over a lace cap decorated with pink roses and foliage. 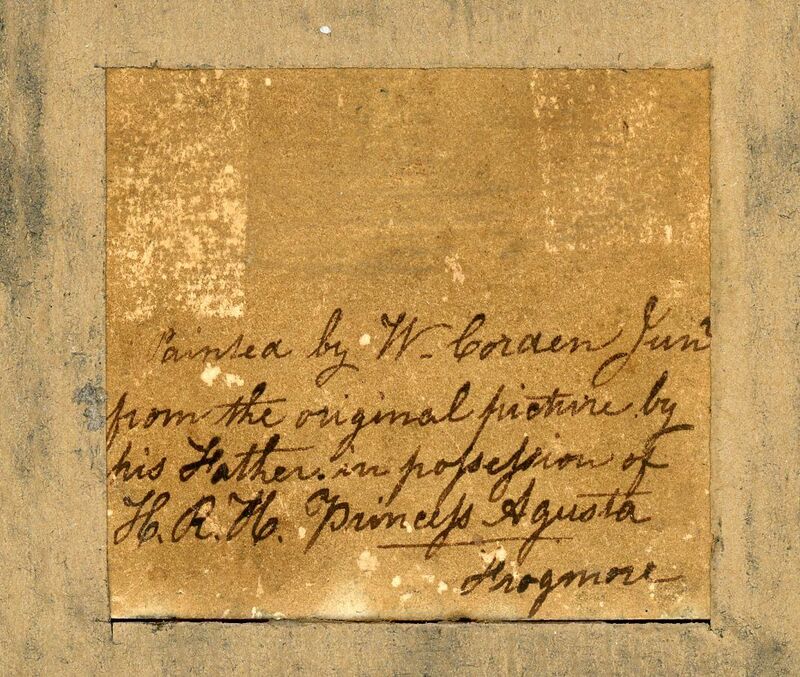 According to an inscription on the reverse, the original miniature of Queen Victoria was in the possession of HRH Princess Augusta, the second daughter of George III and Queen Charlotte. Princess Augusta never married and, when her father died, moved to live at Frogmore House near Windsor. Born in Derbyshire, William Corden Snr (1795-1867) painted porcelain at the Derby Porcelain Works before turning his hand to portraiture. Queen Victoria commissioned him to paint oil copies of portraits in the Royal Collection. 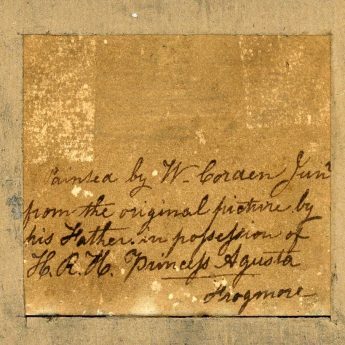 His son, William Corden the Younger (1819-1900), later worked alongside him as a copyist for the Queen. There are in excess of fifty paintings by the Cordens in the Royal Collection. 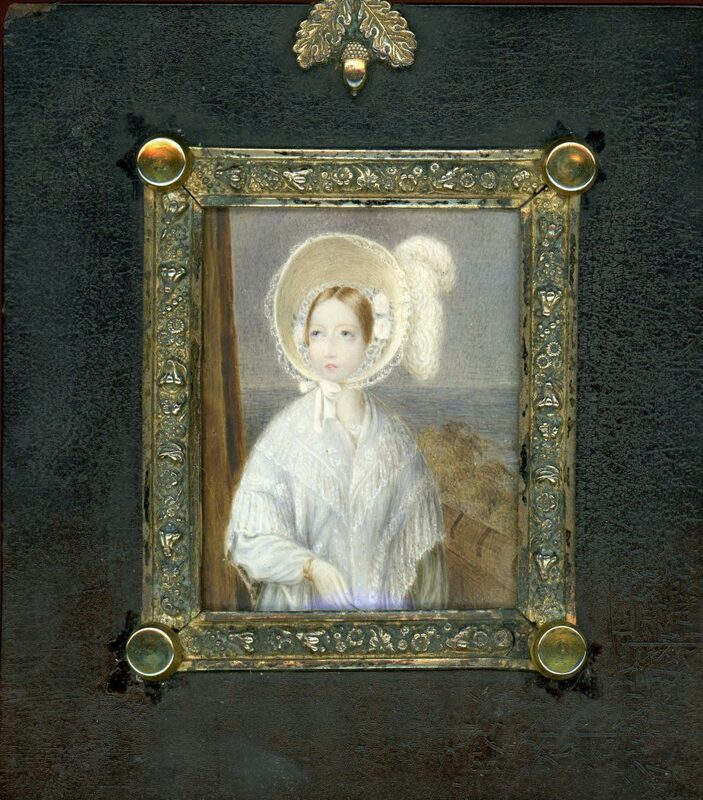 The portrait resides in a traditional papier-mâché frame with a decorative surround and an acorn hanger.